Work along with the Excel Basics video tutorial, and create your own Gradebook. What is the bar in the upper left-hand corner called that is always available? What is the bar that runs across the whole screen called that is made up of tabs and groups? What is the bar in the lower right-hand corner called that can help us view our workbook closer or further? Excel is a program made up of within a . Which is NOT true about Excel? J9 is a location of a cell in a worksheet. What does the J (or letter) stand for? 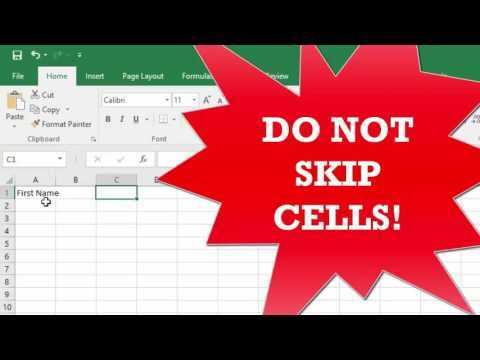 The only way to see if a cell is active (selected) is by looking in the Name Box. Where does my text appear when I type in a cell in Excel? Navigating Excel is the same as navigating a table in Word (except for Enter). I am typing in cell C4, and my text runs into/overlaps into cell D4. The next cell I should type in is F4. How do I 'Autofit' my cells in Excel like I did in Word with my tables? If I want to insert a new column/row, I right click on the column/row, and the new column/row will be inserted the current column/row. To select a cell or range of cells, I need to see . Which is true about the following? I can format text the same in Excel as in Word. To squish a bunch of cells together, I use .